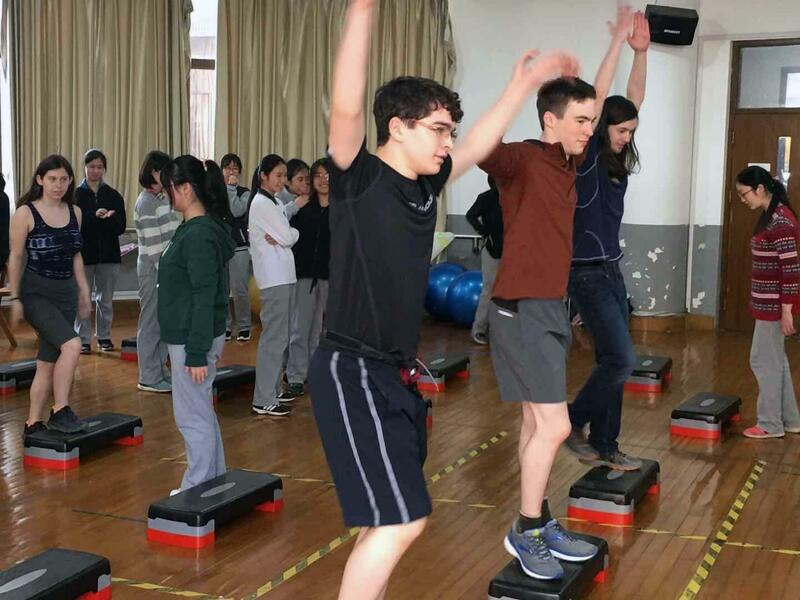 A group of Northwest School students and faculty are in China and Taiwan for two weeks as part of our Global Learning Program. Keep connected to our students by reading their stories below. 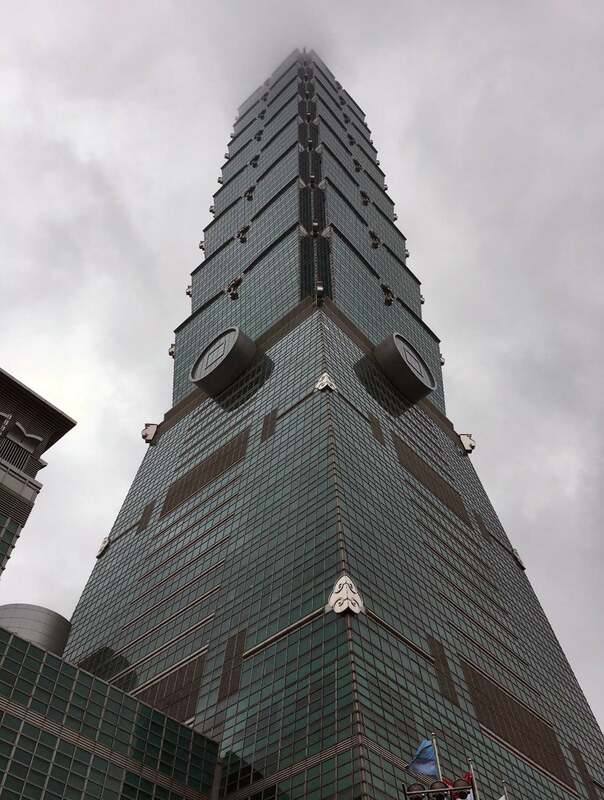 After going to the museum and seeing the entirety of Taipei, albeit under a layer of clouds, from the top of Taipei 101 we had the opportunity to explore Di Hua street, Dadaocheng port , and the Ximen Ding Night Market with students and teachers from our partner school, Zhenda Fuzhong. After taking the MRT to DiHua, while doing so successfully running from one train to another in our first inter line transfer, we walked a while to the old street of DiHua. 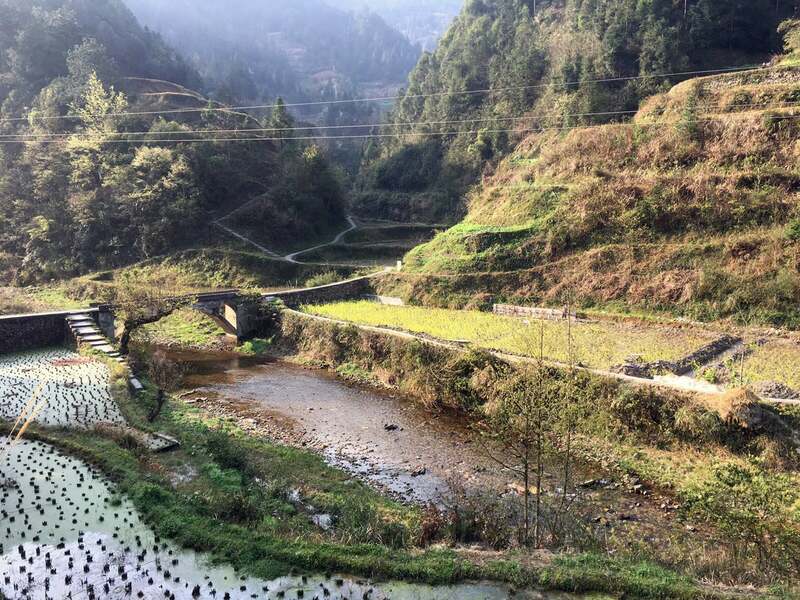 It was a beautiful place, filled with old storefronts and stocked with traditional Chinese candies, tea, dried fruit, preserves plant, smoked meats, and stores selling traditional Chinese medicine. Walking up we passed by a small temple, dedicated to the local god of love. One of our guides, Lidia, told us how praying at this temple might add luck to your love life or guarantee that a certain person will never enter your life again. As soon as she mentioned love we all thought of it as the temple of Adina. Moving on, we entered the old street. It was built in a seemingly classic style, covered walkways fronting buildings with brick facades, some with growing ivies and a certain “patina” of age and grime that lent what one friend remarked to as “aged beauty”. Walking on with our guides we passed by the shops, stopping to buy candy and respond to the shopkeepers as they called out their wares. It was pleasant weather, slightly rainy, but yet warm with a light breeze. Stopping to admire a cat we made our way to the Dadaocheng port. On the way we passed through narrow streets, jumping to the side as motor bikes raced past and enjoying the feeling of the breeze and the sun and the freedom. We were soon accosted by road construction which blocked our only path, thankfully, the workers waved us through, and as we jumped over wet concrete and avoided hot and steaming fresh asphalt, I could not help but think about the the extraordinary kindness that people have shown us here. From the students and teachers to the employees of 7-11’s and owners of Night Market stalls, people here have shown us and unusual amount of kindness, dignity, and a willingness to bring us a little bit into their lives. Stopping at a crosswalk we came face to face with a massive concrete wall. There was a gate in this wall with the name of the port written above in large gold letters. Asking another one of our hosts, Roy, I learned that the rivers in Taipei, a city built in a small bowl made by mountains near the sea, commonly flood. Because of this, the city built large walls and dykes around the rivers. In these dykes and walls there are massive waterproof gates, which allow access but can be closed in the case of flooding. The flood plains around the rivers are still well used however, as parks, play fields, bike paths, and nature areas. This fact helped account for the massive drainage systems I have observed in Taipei. All along the streets I have seen grating and holes leading to a seemingly massive system of trenches and pipes that dump into the rivers. Asking more, we learned that although Taipei is mostly guarded from monsoons by large mountains to the east and north, they still occasionally get catastrophic rain. Moving into the port itself we saw that it was really more of a small park and walkway, with views of the mountains and many bridges over the river, no longer the bustling port it once was. Our time being up we wound our way back to the temple, passing by more shops of Chinese medicine, car repair shops, cafes, and small eateries wafting the scents of smoked meats, pickled vegetables, stinky tofu, and the smell of fresh cooked rice. Now thoroughly hungry, and many of us quite tired, we walked to the Ximen Ding, or West Gate, night market. 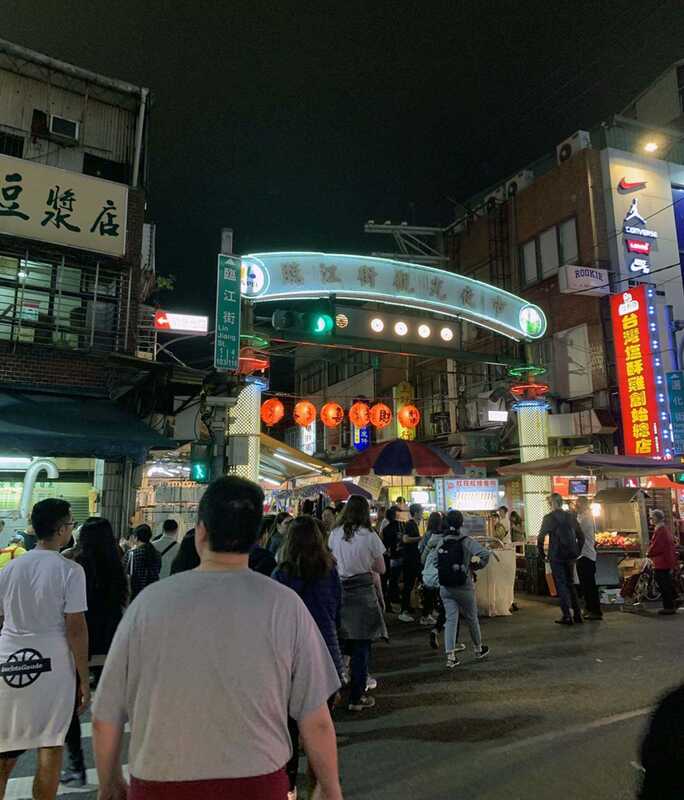 One of our fellow students from Taiwan told us that Ximen Ding is one of the most crowded and popular night markets in Taiwan. 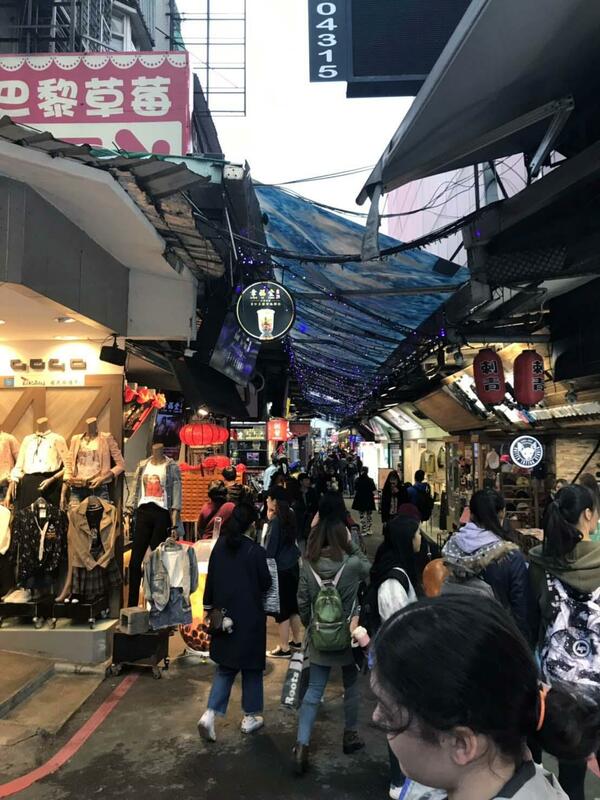 It was especially popular with university students, being filled with food stalls, malls, and small stores filled with clothes, jewelry, and everything else imaginable. Walking through the market, it seemed one of the more regulated ones as well. It was filled with big name brand stores, and there were few food stalls on the street, most of them being established in the lower floors of the buildings lining the streets. The streets themselves were completely pedestrianized, except for the odd Tesla or motorbike, as well as clean, well lit, and conspicuously well maintained. It was a very different, although enjoyable, Night Market experience. For dinner we went to a restaurant called Ma La hotpot. Ma La is the spicy, tingling sensation that Sichuan peppercorns give off. Before the introduction of chili peppers from South America, this was the primary spice in Sichuan, and indeed many Chinese, cooking styles. 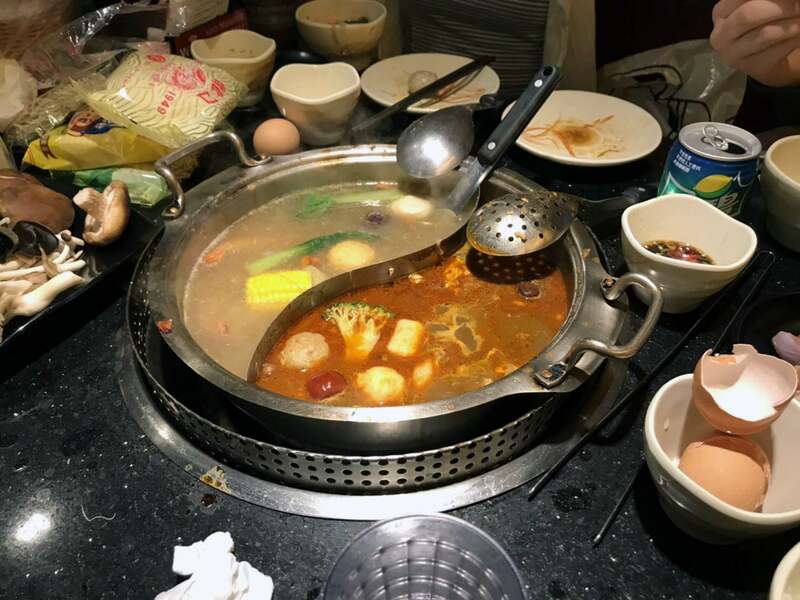 This was the first hot pot experience for many in our group, and afterwords, judging by their reactions, seemed an enjoyable one. The restaurant was on the second floor of one of the buildings lining the streets of Ximen Ding and consisted of an ice cream bar, a drink bar, and truly vast selection of dried noodles surrounded by tables with a built in burner in the middle. On top of the burner was placed a pot divided into two, with one half being a clear broth with green onion and animal stock as well as some unidentifiable spices, and the other filled with a broth made with dried plums, nuts, spices, chili, animal broth, and a healthy glazing of bright red chili oil. We wrote our orders of seafood, meat, and vegetables, and after being served feasted on noodles, ice tea, Calpis water, Sprite, Milk Tea, pork, chicken, beef, prawns, clams, oysters, mussels, dumplings, fish balls, corn, broccoli, bok choy, cabbage, mushrooms of all types, other mysterious fungus, and many things that in complete honestly baffled the others and I as to their identity. New things were tried, including eating shrimp shell, head, tail and all as well as boiled mochi —it should be noted that it was later learned that the mochi was not supposed to be boiled. After a healthy helping of ice cream and other desserts, we split up to continue shopping and exploring the market or ride the MRT back to the teachers hostel. After a brief consultation and meeting, we went our separate, three-grouped ways. We took a bus to see the Taipei 101, the tallest building in Taiwan standing at 508 meters tall. When looking up the tower from below, it appeared to disappear into the sky and go on forever due to how cloudy it had been earlier that day. As we made our way to the building, we had to go through a mall which was full of almost entirely high-end, designer brands. To get up the tower, we all took an elevator that claimed to be the fastest moving elevator in Taiwan. It was large enough that our entire group of twenty people was able to fit inside it, and it traveled at 1,010 meters per minute. We stopped and got off at the 89th floor. The walls around us were essentially giant windows which allowed us to get a good view of the city below. Due to the slightly overcast weather, the visibility was not the best. 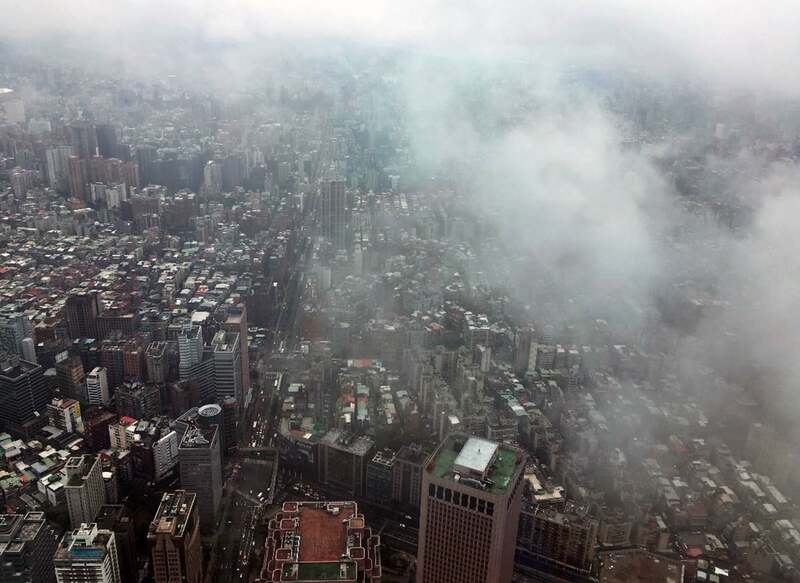 However, the view was still amazing and allowed us to see much of Taipei from above. This floor also had a variety of shops and attractions inside, most of which either selling souvenirs or jewelry. The souvenir shops mostly sold items such as clothing, replicas of the Taipei 101 in varying sizes and colors, and even Taipei 101 themed playing cards. The jewelry shops sold necklaces, earrings, and bracelets, almost all of which were made from jade. One of the attractions was a small exhibit on the Amis, one of Taiwan’s many indigenous groups. This was one of the most interesting things I saw inside the Taipei 101. The exhibit showed off traditional Amis clothing and tools, as well as music in their native language. It also briefly described the history of the Amis people and how their culture stayed alive in modern day Taiwan. After walking around this floor and looking at all the shops and admiring the view, we all headed down to the 88th floor. On the 88th floor, there was a giant shop that nearly took up the entire floor. This shop sold primarily jewelry and sculptures made from either jade or different varieties of coral. These sculptures were incredibly detailed and beautiful, and many of them cost millions in Taiwanese money. Many of these sculptures depicted figures and creatures from Chinese culture and folklore. Others were depictions of the Buddha and animals from the Chinese zodiac. The shop also had two large geode rocks that looked to be about three to four feet tall. This part of the building was admittedly one of my favorites aside from the Amis people exhibit. Looking at all the artwork on this floor, it felt like being in a museum, and it was hard to tear myself away from it when we had to leave for lunch. Today we landed in Taipei at around 4 PM, we went to the hostel to drop off our luggage and then went straight to the night market. We met some students from our partner school in Taipei and walked to the market. We divided into groups of two Northwest students and one student from Taipei. Melia and I were put with a student named Joyce. Joyce showed us around the market and recommended some of her favorite dishes. We challenged ourselves to try as many foods as we could, and we think we were quite successful. (Over all, we tried 14 new things) Joyce told us that the three most important foods to try were: boba milk tea, rice with pigs blood bun, and stinky tofu. This is the entrance to the night market. Although we came near the opening time of the market, the street was very crowded. Night markets are very popular in Taipei, and they usually stay open until late at night. Here we are at one end of the market underneath the market sign. The first dish we tried was a sausage with garlic and green onion. The outside of the sausage was coated in a sweet soy sauce and it was very hot and juicy. Then we tried strawberries coated in caramelized sugar. The sugar was hard and crunchy, and the strawberries were juicy. Next we tried a millet donut coated in milk sugar! It wasn’t a traditional American donut, instead it was very thick, sticky, and soft. We tried four kinds of small cakes served hot off the grill. Pictured is a cake with corn and a cake with green onion. The outside tasted like pancakes. We had two other cakes with cream and chocolate. We then got some bubble milk tea. We got two kinds, brown sugar with tapioca pearls, and brown sugar with grass jelly and tapioca pearls. They both were very sweet drinks and were filling. Next we ate a freshly made green onion pancake. It was very thin and crunchy on the outside and soft on the inside. Then we tried a lamb kebab. It was coated in spice and was very juicy and flavorful. Although it looked funny, I really liked the kebab. Teo, on the other hand, was sad about the fact they called it sheep. Next! We had a fried spicy cheese roll with beef ( or as they called it “beff”). On the side there was pickled cabbage and carrots, as well as a chili sauce. The chef, who specializes in cheese rolls, was on a 1001 Taiwan restaurant TV show, where he shared the behind the scenes of making the rolls. We then tried the infamous stinky tofu. We could smell the stink of the tofu even though we weren’t standing near the booth. I didn’t mind the smell of the tofu, and actually thought it smelled good, while Teo and Joyce did not. The tofu however didn’t taste as stinky as it smelled, and was a little sweet. It was fried and had a sweet soy sauce on it. On the side was more pickled cabbage and carrots. Last thing we tried was steamed dumplings with pork and green onion. We were both so full by the time that we bought these, so we tried one each at the market, and are eating the rest as we write. To start off the day we wake up to go and grab breakfast at the school’s cafeteria. We serve ourselves from the options of bao, rice porridge, and delicious noodles. After we ate breakfast, we visited a Confucius temple where we saw calligraphy, pottery, 1000 year old books, and statues of holy monsters and Confucius. It was super interesting and helped educate the whole group on Confucianism and how Chinese Language and art styles became a reality. We also got to see what used to be the tallest building in Shanghai which was inside the gates of the temple right in front of two sky scrapers that towered over it. 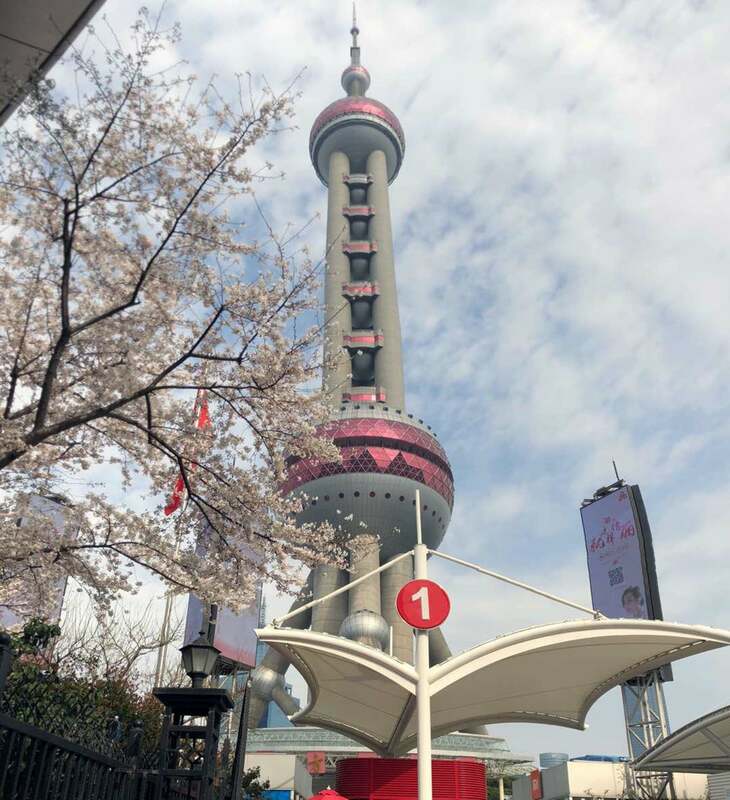 The next step on our journey of the day, was when we visited the pearl tower in shanghai which is one of the most iconic buildings on Shanghai’s skyline. After going up hundreds of floors, we looked across Shanghai and got to admire the beautiful city. On the pearl tower their was a glass see through over look to the show us how high we were above Shanghai. Some people were a little scared to step on the glass, but most of us had a fun time taking pictures and lying down on the glass! We went down the elevator and at the base of the pearl tower there were a lot of shops and even a museum about the evolution of culture, clothing, art, and architecture in Shanghai. For lunch, we went to a market where we all received a some money from the teachers to explore the market in small groups and try unique vendor foods. The group I was in tried, squid on a stick, fried dough, spicy soups, and dumplings. It was super fun to wander through the market and see your peers and friends trying these new foods. Overall the market time went by fast and was a very memorable part of the day. Then we went to a different kind of market where we bargained. My friend and I got matching Gucci belts that were originally 1,300 and instead got them for 150 yuan. It was very fun to find gifts for friends and family and try different techniques on how to get the items for a good price. This is a big part of Chinese culture around tourism and is a way for people to make money from selling souvenirs and tasty foods! At night we went on a cruise around the Huangpu river in Shanghai and we got to see all the different districts and architectural eras. The lights on all of the buildings were mesmerizing and were very creative and fun to look at! This was our busiest day so far, but also one of the most fun days so far! Put Those Hands In The Air (A-AYER)!!! Today we were given the opportunity to observe or participate in one of 3 PE classes. Austin and I both chose that we wanted to start with observing the dance class. At first we felt a bit awkward as a small group on the side of a room full of jump-suited dancer, but that was about to change. All of us on the side started dancing along to the “aerobi-cise” video that started playing. All of us started to let go of our self-consciousness and did our best to copy the moves that the dancers on screen were doing. Man, we really got going. Sweat dripped, tears (didn’t) fall, blood was actually spilled (we were waving our arms and someone got smacked). Then, just as we peaked, the video ended. The students then took out boards and started dancing on them. We were sat on the side when all of a sudden a song started to play which ignited a deeply recessed memory to the tune of “In the Ayer” by Flo Rida. There was no stopping us. At first it was Callum with his “hands in the Ayer A-Ayer”. Soon he was noticed and we were all invited to join the class in full. We started by trying to copy their already choreographed routine, but it soon devolved into us making up our own moves. We. Were. Committed. We soon preformed for the whole class, and dare I say, we killed it. We not only kinda sort interpreted the class moves into a copy of there dance, we also brought a taste of our culture though lindy hop (thanks social dance). We then took a photo with a few of the girls from the class afterwards. feeling tired we headed to lunch and prepared to attend a forum which was to be held with students from the Northwest School and Dajing high school. At the forum we discussed similarities and differences between Chinese and American film consumption. We also used there trends to pitch our own movies. Mine was called “Utopia of Banan” it stared Liu Yifei (for the uninitiated a famous Chinese actress) as an alien princess, and Tom Cruise as a crash-landed thief who loved to run. The story was a mash up of Journey to the West and Aladdin. Also the planet was covered in Banan peels (similar to bananas). 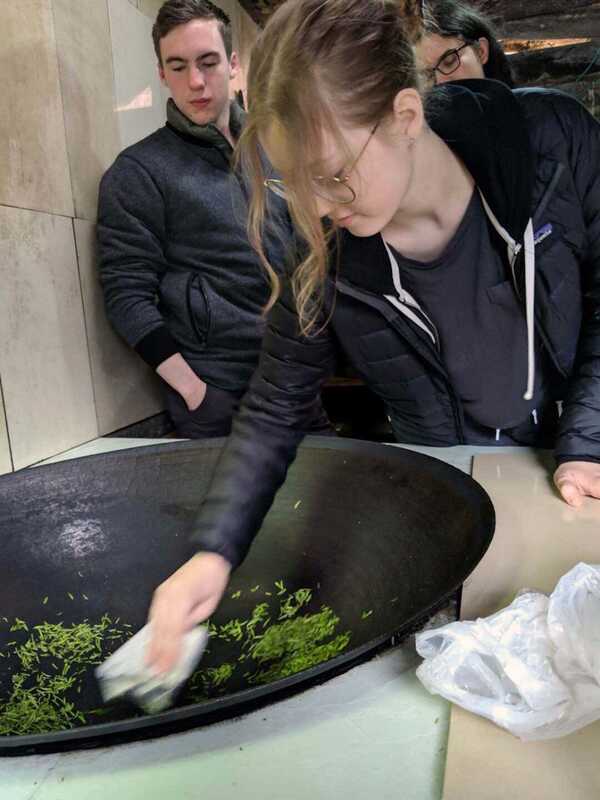 My groups film was about a newly divorced chef who moved to China, and through his struggles to start a thriving restaurant surrounds himself with community and food. I got along really well with my group and was fascinated to talk about the differences between the Chinese and American industries and hear their perspectives about American culture through the lease of film. We went to a confusion temple. It was very interesting to look at the evolution of Chinese characters, and to watch my classmates who knew more about Chinese piece them together. It also served as a museum with lots of interesting artifacts from earlier time periods. 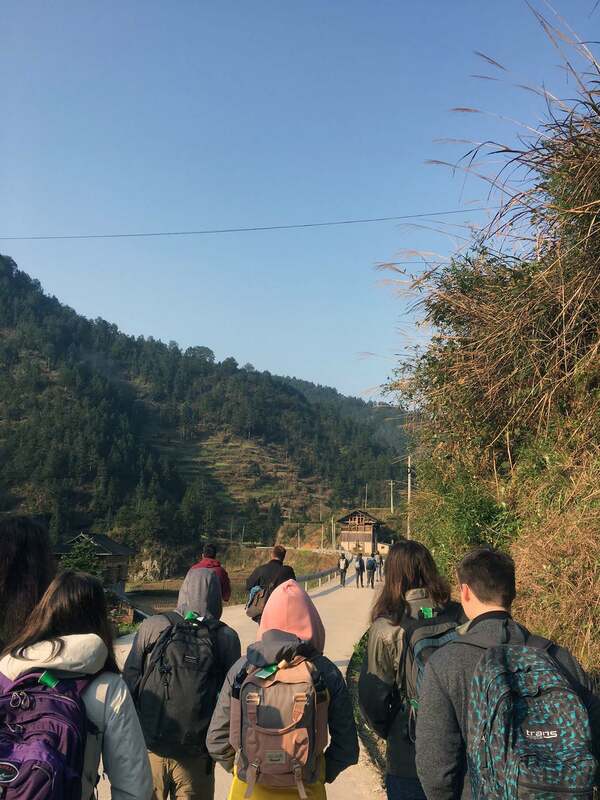 After getting a window into some of China’s deep and rich culture, we headed back to the school to de-stress and reflect on the days experiences. I woke this morning early to roosters alerting to the sunrise once again, a sound that has become surprisingly familiar over the past few days. After lightning round packing and leaving our host some gifts in the kitchen, we all headed with our luggage to the meal house for our final village meal. It was the same as before but still delicious! Then time to hike to the bus stop to hitch a ride to the bullet train station. The sun finally appeared right as we were leaving (of course!) but it made the hike quite nice. All rolling green hills and rice paddies filled with people and cows and carts carrying harvested vegetables. When we finally got to the bus I was glad though - an hour to the bigger city where the bullet train station was located. Lots of observing the scenery out the window which quickly morphed from rural to urban, small houses to giant tall high rises. Rush rush rush into the station, visiting a few convenience stores and purchasing tea with the prettiest label I’ve ever seen and some bright green dried kiwi among other things, then a brief sit before trying to get on our platform. After some frantic minutes of conversation between Jack and the security lady, at first we thought we missed the train altogether and that was TERRIFYING! 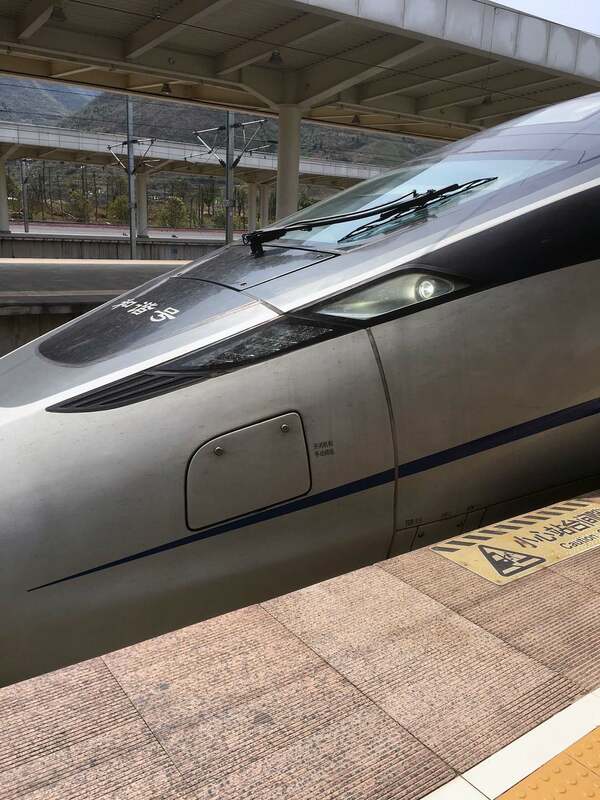 Because no bullet train means a 30-hour super slow train and everyone hates those. However it just turned out it had been rescheduled to a half hour later and that was just being lost in translation. Thoroughly adrenaline-filled, we sat for a bit longer before rushing onto the platform. You only have five minutes to get on the train once it arrives, which is ridiculous, but luckily all of us made it on. When I got to my spot someone was already in it but I just let them be and sat in the aisle. The lady and gentleman across the aisle were staring at all of us very intensely and the lady was trying to covertly take lots and lots of pictures of us but I definitely noticed. It was really invasive and uncomfortable and I wasn’t sure exactly what to do, so I just let it be. We were warned about situations like that before we left but I still didn’t feel totally prepared with how to deal with it. Luckily though the people in my spot and the spot next to it got off at the next stop so I took my rightful place next to the window. Two stops later, a lady gets on and sits next to me. Only a little after she sits down, she shows me her phone which has a translator app on it. It says converted to English from Chinese, “are you tourists?” I told her no, we were visiting students, and that started a conversation via translator that lasted nearly two hours. Her name is Taoli and she is a silver jewelry seller as an occupation, and she traveled into the mountains we were in over the weekend recently. She showed me many pictures and videos which were very well taken! She complimented me, and of course I had to compliment her too after that so I mentioned her lipstick and how the color looked gorgeous. And you know what this lady did? She insisted on giving her lipstick to me! She said she had another one at home and I initially refused of course - I mean, it’s her lipstick, I didn’t want to take it from her! - but she absolutely insisted. 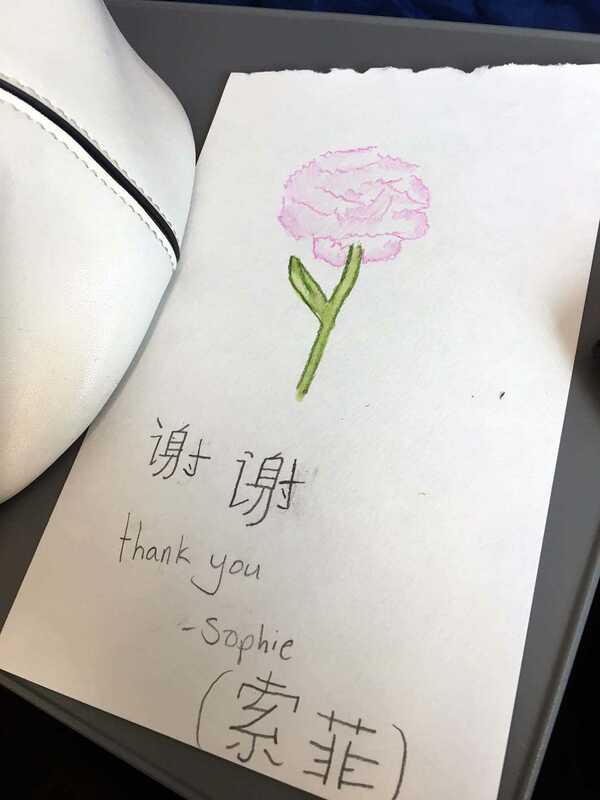 So to say thank you I painted a quick carnation and wrote out thank you and my name in both English and Chinese. She tucked it away in her bag and I was just super super happy about the whole encounter. She said I was the first foreigner she had ever talked to so I’m glad I made a good impression! We tried connecting through WeChat but mine is broken for the time being so we tried texting to no avail. Eventually we settled on Twitter, something neither of us had but both got to talk to each other later. My gosh what a lovely lady! Such a blessing to talk to, I’ll never forget that as long as I live. The contrast between the people taking pictures of us and Taoli, a near stranger’s, kindness was quite stark. It completely changed my comfort in this new country. Before, I felt kind of lost, not quite knowing how to interact with people and just generally feeling awkward. But after that good encounter, I feel much more comfortable and excited about the new experiences ahead of me! Nine long hours on the bullet train stretched on, green pastures transitioning to bright city lights. I was exhausted but didn’t let myself fall asleep - I kind of couldn’t! We got to the Shanghai station, hopped an hour long bus to the partner school, ate dinner, and collapsed into bed around midnight. Goodness what a whirlwind day! I woke up to clouds and roosters crowing. I could hear our host family downstairs, cooking their own breakfast. The house I’m staying is tall and wooden. Steep stairs lead down to a sink and shower. Winding paths lead to outhouses and serve as homes for dogs (I wish I could pet them all) and chickens. After putting on hiking clothes, our group convened for breakfast in our ”home base,” a large concrete building in the center of the village. We were all shivering in the 40-50 degree weather, but ready for the day ahead. Shortly after breakfast, we started our first of two treks—up a mountain to pick fresh tea leaves. Straight uphill for forty minutes. My legs hurt so bad, but the views were worth it. The village shrunk and shrunk until it was a bunch of tiny dots nestled into terraced mountains. We were often passed by motorbikes and villagers on foot, carrying gardening tools and baskets. Soon we arrived to the field of tea bushes, hidden off the main road. Our guide Ted explained that these tea leaves could be used to make any type of tea—green tea, black tea, red tea, yellow tea, and more. The teas taste different depending on their oxidation levels, or how long they are fermented. 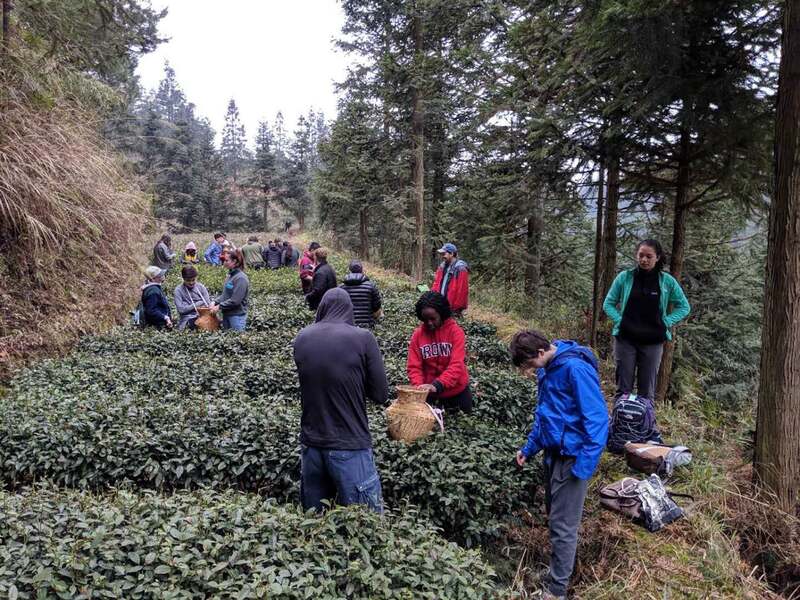 We were picking green tea, which takes the shortest time to brew. We only picked the tiniest buds on the tea bushes, which gave the purest flavor. Ted also explained that the higher the altitude, the better the tea leaves taste. After about an hour of picking, my hands were frozen and we were done. The tea leaves were so small they only covered the bottoms of our woven tea baskets, but as we soon found out, our harvest would be more than enough. We hiked back down, had lunch, and started the tea making process. In groups of five, we entered a small kitchen and poured our tea leaves into a big wok with a fire stove underneath. Careful not to touch the hot pan with our hands, we stirred the leaves until they dried. Then we let them ferment for about 20 minutes. After a bit of waiting, the tea was ready to drink. We lined up and mixed the dried tea leaves with water. I was surprised to see the leaves rehydrate—they went from looking dead and dry to alive and healthy in the blink of an eye! It was more bitter than I expected, but I liked the taste. It was rewarding to see our hard work pay off. It’s cool to know our tea was growing on bushes an hour before, instead of sitting in a box for months. 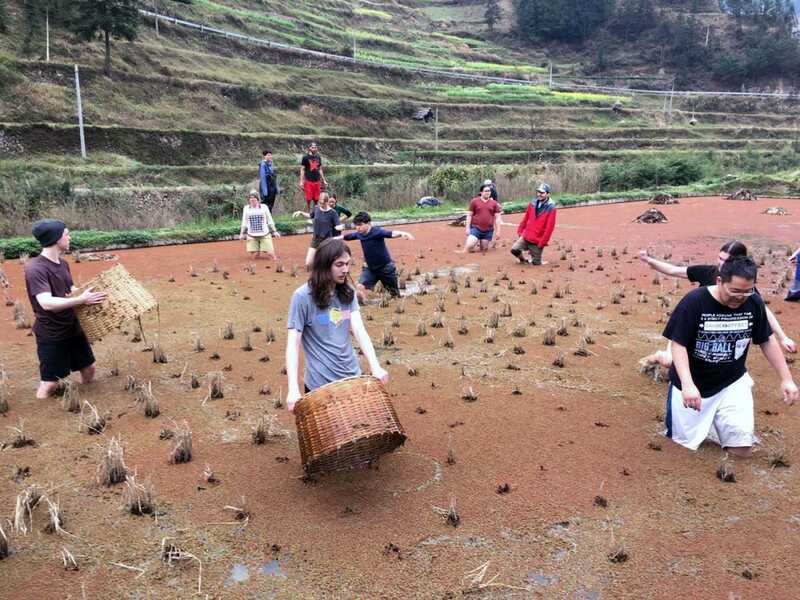 After drinking tea, we headed down the village road in shorts and flip flops for our next activity—catching fish in rice paddies. Though we’ve had access to more Western food (on the plane and for breakfast with cereal and toast) both the preparation of the meals (especially in the rural areas we’ve been staying in) and the meals themselves are very different from my experience in America. The food is cooked in a really big wok (the same big bowl we made the tea in). The heat makes the kitchen one of the few rooms that is truly warm. The meals mostly have the same structure of either rice or noodles with vegetables and/or meats. The vegetables are picked fresh from the surrounding area and cooked in our meals. We eat the meals communally in a cement building that was recently renovated (all of the places we’ve been through have had renovations going on because of the influx of money from tourism in China). It’s just as cold as outside, so about 40 degrees. The tables are really short and the stools that we sit on are short and tiny, kind of like something you would find in a kindergarten classroom. We drink a lot of soda since we can’t drink tap water (one of my friends commented that he had drank more soda on two days of this trip than he usually drinks in three months). I watched them kill the fish that we caught in the rice fields later (they fillet the fish alive, as is traditional in Chinese Miao fish preparation). The walk to the rice fields was flat and pretty (as it usually is, because the village is surrounded by nature). Just being outside (and inside, because the buildings don’t really have insulation) is really cold so I was pretty nervous to get into the water. It could have come up to mid torso, but the water only came up to our knees. The first couple minutes were f r e e z i n g (so much so that it was painful,) but then your legs and feet get numb and you’re able to move around a bit more. There’s a thick layer of mud on the bottom that your feet sink into (and that also make it impossible to wear any kind of sandals). Sometimes you could get stuck in the mud and lose your balance a little, but only one member of our group fell down. To catch the fish, there is a kind of bucket with no bottom that you stick into the water to trap the fish so that it’s easier to grab them with your hands. I was able to catch one fish with the bucket and grab two with my hands (that someone else had trapped in the bucket) on different occasions. In total, we caught about six fish, more than the last China trip’s two fish. The goal was for people to herd the fish towards the four people with the buckets, which worked in the end. It also helped to aim for any air bubbles you saw in the surface of the water. It was pretty muddy and dirty and cold, but a very cool experience.